Books based on calamities frequently gain quick popularity with their topical subjects, such as Dave Eggers’s Zeitoun on Hurricane Katrina. 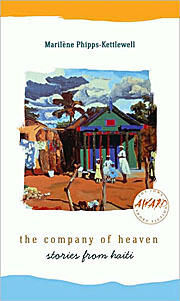 The Company of Heaven: Stories from Haiti, however, reminds readers of a country that struggled with fear and poverty long before its recent serial disasters of earthquake, flood, and cholera outbreak. This fiction debut by Haiti native and poet Marilène Phipps-Kettlewell contains twelve short stories and one novella that paint a resilient culture, heavy with grief and confident in better days ahead—whether on earth or in an afterlife. tonight, you light three candles on the floor. Arrange them in a triangle facing east or north. Place a glass of sugar water in the middle of the triangle. Stand and pray. Call out to all your Spirits—those on your mother’s side and those on your father’s side. Tell them your hopes. A personified chapel narrates another story, offering a similarly poignant island portrait from its unique perspective: “Dogs neither sleep nor perch. They are tied down somewhere in the nearby slums whose gray fossils’ framework hangs amidst bushes at the foot of the mountain. It is as if everything is held, somehow, at the foot of something greater.” Powerful voices like these act as tour guides through Haiti’s singular society and blighted spots. Many of these narrators have familial ties with other characters, though the collection may frustrate readers wishing to tease out a precise family tree. Characters receive minimal introduction. For example, “Down by the River” begins, “It is Saturday . . . so Angelina sits and waits by the phone. Most Saturdays she sits in the big office chair that used to be my father’s.” Here we meet three figures; however, instead of learning about them individually, we hear about a ritual that unites them. With this move, echoed in several stories, Phipps-Kettlewell succeeds in depicting the Haitian people as a community rather than emphasizing individual characters. As might be expected, Phipps-Kettlewell also tackles weighty themes throughout The Company of Heaven. For example, the novella “River Valley Rooms” probes class conflict and, most memorably, the effect of AIDS on Haitian society. The narrator suggests that Alan, a vibrant homosexual, has spread AIDS to herself and her brother, Justin. Justin infected his wife and infant son, both deceased. Grappling with this widespread mortality, the narrator offers a terrifying view of death, as “water that slowly rises in the room, nearing the ceiling. There is little space left, and you try to stay above water. 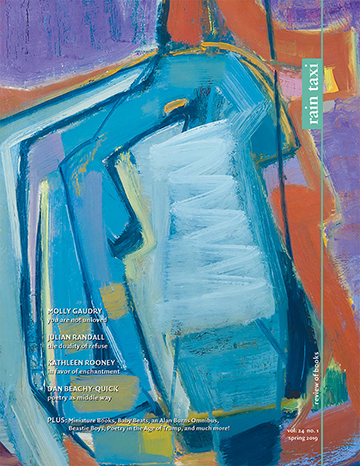 The ceiling is always too low, too close.” This narrator’s highly imagistic language limns AIDS’s protracted destruction of a life, rendering a moving firsthand account of the disease. Phipps-Kettlewell balances the heaviness of those themes with a playful study of Haitian religions; the characters practice Christianity and Vodou in tandem, creating an interlaced spirituality that governs their lives. Take the priest, Djezél, in “Land”: he practices traditional Vodou ceremonies, such as placing land crabs on the heads of those afflicted with sexually transmitted diseases, while crediting God for his healing powers. “If something has happened,” Djezél explains, “God somehow allowed it. . . . People come to me with their problems and I do what I can.” Phipps-Kettlewell echoes his easygoing religious attitude in other characters, providing a unique look at the way these two religions coalesce in Haitian culture.